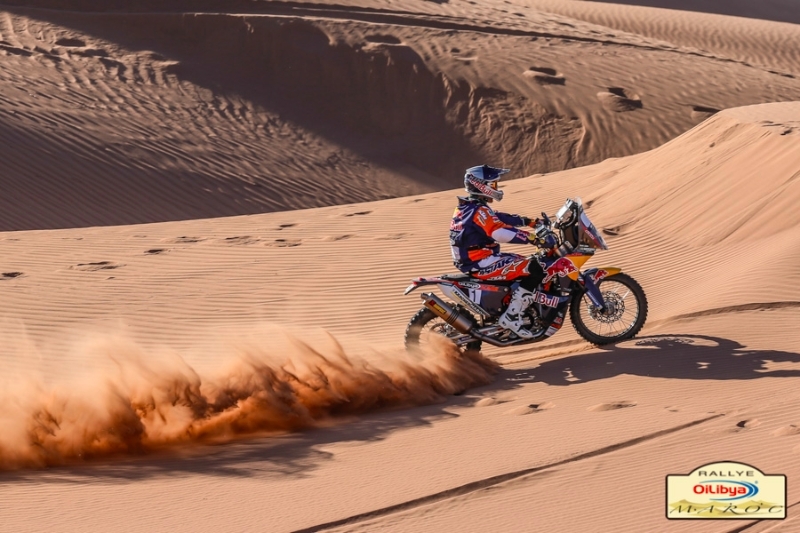 KTM factory rider Marc Coma opened his account in the OilLibya Morocco Rally on Monday with a second place finish in the stage, trailing leader Joan Barreda of Portugal by just over three minutes. Coma is looking to seal the 2013 FIM World Cross Countries Rally Championship title at this event in Morocco, which represents the final rally of the 2013 season. He is the championship leader by a narrow three-point margin from Paolo Goncalves of Portugal and the contest is expected to be tough between these and other riders. 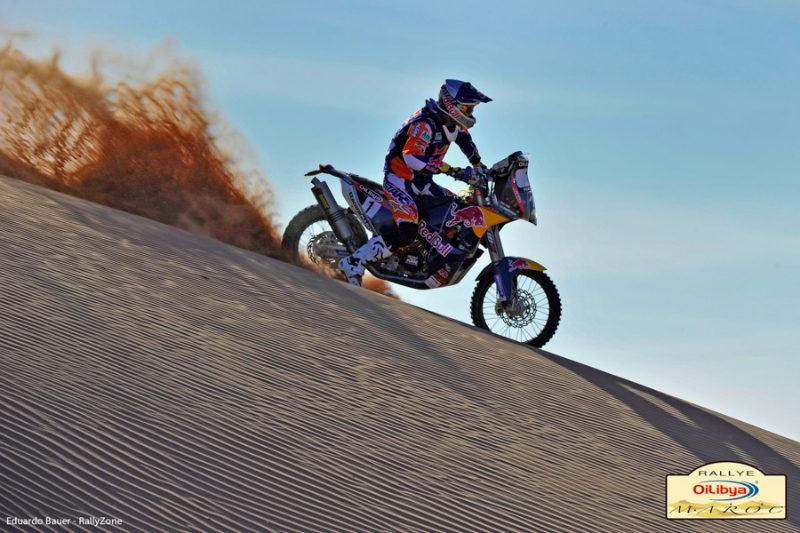 The rally is disputed over six stages, much of it in typical sand and dunes, the preferred terrain for KTM’s three-times Dakar Rally winner. The Red Bull KTM Factory Team are also using the rally as its final preparations and testing before the Dakar Rally in January 2014 and have unleashed the brand new KTM 450 Rally bike for the occasion. Joining Coma in Morocco are factory riders Chaleco Lopez of Chile and Ruben Faria of Portugal who finished 5 and 12. Teammate Kurt Caselli (USA) was ranked at seventeenth after the opening day after incurring a 20-minute penalty for missing a waypoint. KTM Australia’s Ben Grabham was a creditable eleventh after stage one and the secodn KTM support rider, Riaan Van Niekerk of South Africa was sixteenth. The track took riders over two liaisons of 77 km and 65 km and one selective timed sector of 203 km. They first crossed small dunes before having to navigate to Oued Draa over many parallel tracks. They then hit the first of the challenging dunes that brought them across the beautiful erg Cheggaga from southwest to northeast. KTM Factory Team manager Alex Doringer said it had been a good first day of the rally with the new bike. “We are very satisfied with Marc’s ride in second place and we had no technical problems at all with the new bike,” he said adding that Ruben Faria is still having some problems with his hand, which he broke contesting the Dos Sertoes Rally in Brazil several months ago. “Chaleco (Lopez) took it easy today and we are happy with his position after the first stage but Kurt Caselli, our rookie team member made a navigational mistake and missed a waypoint. It is a learning process for him.” Caselli was the replacement rider for the injured Marc Coma in the 2013 edition of the Dakar Rally but is now part of the official factory team. The rally is made up of six stages and tomorrow riders tackle a liaison of 49 km, a selective sector o 240 km and another short liaison of nine km as they travel in a circular route from Jbel to Jbel.